Definitely heard of cardio exercises, but don’t know what they are? Well, cardiovascular workout or aerobic exercise or cardio exercise if you prefer, is a type of physical activity meant to raise the heart rate. The percent that we’re talking about revolves around 50%, but not less than 50 and over 85%. 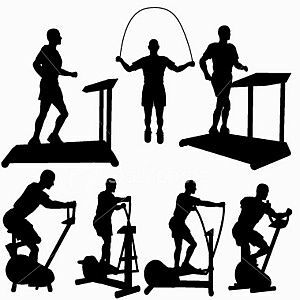 These figures have to be constantly sustained over a period of time, so only stable and steady efforts are part of the art of making cardio. Cardio exercise is all about exercising the body’s most important muscle: the heart. But keep in mind that all of this has to be done at a steady level. Short periods of making large physical efforts, like lifting weights for example, define anaerobic activities, the heart losing capability of providing enough oxygen to sustain the activities, and therefore, they cannot be called cardio exercises. Cardio exercises are the perfect activity to preserve your good health, but you might also need them if being overweight is an issue. If you’re just trying to make some changes regarding your lifestyle, cardio exercises are the perfect way to improve your health and bring a positive aura to your life. You can lower the risk of having heart diseases and failures just by walking 20 minutes a day, 3 days per week. Since cardio exercise is all about engaging continuous, steady physical effort, it is recommended to work yourself 5 or 6 days a week for at least 30 minutes, either in a full, longer sessions, or portioned into few, smaller sessions of 10 minutes each. Losing weight requires a more intensive and continuous effort, and anyone should know cardio exercises are not enough to burn all that fat. Cardio is one of the steps involved in aquiring that perfect figure that you’ve been dreaming about. In order to lose weight, you need to create a calorie deficit by burning and cutting calories. Try to eat over 1200 per day though, or you’ll get worn out and deprive your organism of essential nutrients that are needed to preserve energy and more. The best health advice is 45 minutes of physical effort or more, five or six days a week will guarantee you losing weight with the help of cardio exercises. Now whether you choose to live a longer, healthier life, or you’re planning to lose some weight, it is important to know what types of cardio exercises are there and use one that best suits your exercising capacity and needs. Whether you’re a beginner and want to start with easier cardio exercises, or you want to engage in some serious activity, it is important to adequate your cardio exercises. Lots of options to choose from: walking, bicycling, swimming, riding a stationary bike or using a workout step, dancing, sprinting or jumping rope and many, many more.